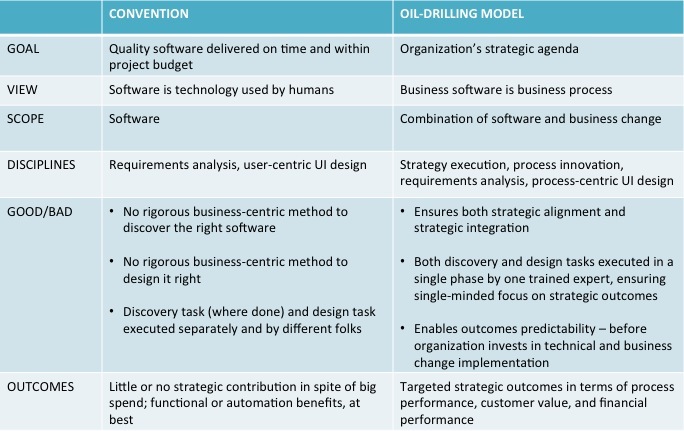 The oil drilling model is a method to discover and design a combination of software and business change that has strategic potential. Using the resulting integrated architecture, the software team implements the software as they always did and the business team implements changes to business. The combination of software and business change helps generate targeted strategic outcomes. Interestingly, the oil-drilling model is an outgrowth of PCD or business process centric user interface design. Pradeep Henry created the oil-drilling model’s first version around 2005. It was called process-efficient technology (PET) because the focus then was on creating efficient business processes. How did Henry turn PET into a strategy-driven method? An important input was executive education at Columbia Business School NYC and reviews by Columbia faculty and executive participants. Drill. Design the software's business side, which comprises business processes to be encapsulated in the software and user interface. Seven principles guide the execution of the oil-drilling model. The method also has templates for capturing organizational strategic agenda, etc. Oil-drilling model is executed by an experienced business analyst trained in the strategy-driven discovery and design method. Who is using the oil-drilling model? The oldest precursor of the oil-drilling model (see “Origins” above) has been used in a dozen projects for global companies. Credentials below suggest interest in business-centric software methods. A fundamental in the oil-drilling model is the bringing together of technology and business change. Business change is typically in terms of process innovation. 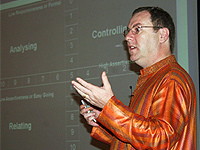 Henry, supported by his team at Cognizant, featured Business Process Management (BPM) pioneer Mark McGregor at a BPM conference in Mumbai, India (this conference was also the first in the country on this topic).